A brief history of the automatic taping tools and drywall trade. In 1939, Bob and Stan Ames invented the taping tools in Georgia. A production line of taping tools that revolutionized the drywall industry. The company pioneered automatic taping and finishing tool technology and dramatically improved the speed, quality and finish of the professional. The automated taping tools have been a valuable introduction to the trade. The tools range in cost from £2000 to £3000 but can also be leased. Excellent results were being achieved in hand taping but it was time consuming and it took a lot of skill. With all this drywall being hung, there became a need to develop an efficient method of finishing joints. In 1939, the Ames brothers started experimenting with new ways of finishing drywall. They were painters and plasterers who came up with the Corner Shoe, which was the first of a long line of drywall tools. The Corner Shoe applied joint compound to seams using air pressure and a long hose. 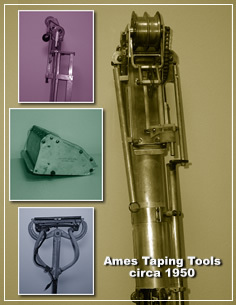 Ames came up with the pre-curser of today's Bazooka (automatic taper) in 1945. The automatic taper applies compound and tape to seams and corners all in one motion. This first taper was battery powered and weighed more than 100 pounds when fully loaded. In the early 1950's, Ames introduced the first boxes. Boxes apply the finish coats of joint compound used to conceal seams. Over the years, a lot has happened in the development and improvements on existing tools. In the early 1960's, many of the patents that were filed by the Ames brothers were starting to expire and competitive tools entered the marketplace. For the first time, Ames tools were not the only tools being used by drywallers.